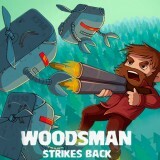 In this game you will have to help the bravest guy and protect his forest from many enemies. Just use the mouse to control him and mouse button to shoot. Are you ready for that? Then just do everything right and have so much fun here.